A mutant potato learns that he’s pear-fect just the way he is in this bright, fun, and silly picture book from the creator of It Came in the Mail that will have kids collapsing in giggles (and rescuing the contents of the vegetable drawer). "Nothing wrong with the self-esteem of this moldy potato, who enters a cuteness contest against fluffy bunnies and cuddly kittens. Rot believes in himself until the world does too." "Readers would be hard put to find a decomposing spud with a more winning personality." "Rot is not the cutest in the world. He’s a “mutant potato” with stick legs, four straggling hairs, and a substantial unibrow. What he does have is confidence, and when he sees a sign advertising the Cutest in the World Contest, he’s in.... It’s a challenge to draw a character who’s both repellent and still appealing to readers, but Clanton (Boo Who?) does not pull his punches. He treats familiar themes—being and believing in oneself—with a light hand. And he explores, with sensitivity, the visceral reaction to real ugliness and suggests a path through it to the other side." "Rot is a mutant potato with sparse hair, unibrow, nubby teeth, and asymmetrical eyes.... Clanton’s use of speech and thought bubbles, dynamic text placement, varying font styles and sizes, ample white space, and great facial expression all make for a fun (and fun to read) tale of self-acceptance. VERDICT: An entertaining and irreverent take on self-confidence; a strong choice for large collections." 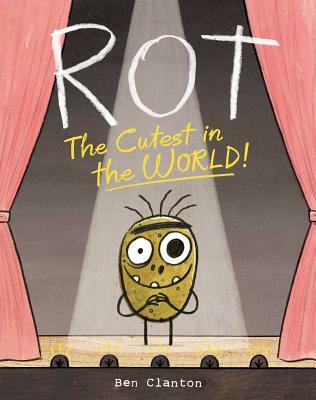 "With his mismatched pupils, different-sized nostrils, and unibrow, Rot isn’t your normal-looking potato.... The mixed-media illustrations in soft colors (brown for Rot and pastels for the others) show only the characters and minimal props against stark backgrounds, which gives this a theaterlike quality and accentuates the performers and action.... While there is a message, it’s the playfulness and fun that are front and center. This deserves at least four rotten potatoes, and in Rot’s world, that’s a good thing."